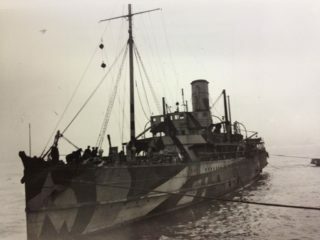 SS Peel Castle in WW1 war service. Wikipedia: By Unknown - Harvey Milligan, Public Domain image. George Torry is one of the men named on the Bottesford ‘church list’ of WW1 Servicemen. George Henry Torry was born on the 14th July, 1897, in Sheffield. His father was William Henry Wharton Torry, born in 1874 in the Newark area. His mother was Sarah Jane Allen, born in 1877. William and Sarah were married on the 24th October 1896 in Nottingham. In 1891, William Torry was an iron turner’s apprentice, living in Mill Lane, Bottesford, with his parents, George and Lucy Torry. George Torry was a railway signal fitter born in 1853 in Boston, Lincs. Lucy was also born in 1853 in Boston, and they had married in 1873 in Boston. Presumably, they had moved with George’s work assignments, to Newark and then to Bottesford. In 1901, William Henry Torry, now an engineer’s turner, lived at 52 Wood Road, Wortley, near Barnsley in South Yorkshire, with Sarah Jane and new-born daughter Evelyn. They also had a young son, George Henry, but he was living with his grand-parents George and Lucy Torry lived on Chapel Street, Bottesford. Evelyn was not recorded in the census in 1911, and may have died as an infant. By 1911, William and Sarah Torry had moved back to Bottesford, and lived nearby 2 High Street with their children, William (6), Sarah (4) and Edward (2). George and Lucy were close by at 30 Queen Street, with their grandson George Henry, now a thirteen year old schoolboy. George Henry Torry joined the RNVR (Royal Navy Volunteer Reserve) as an Ordinary Seaman aound the end of 1916, when he had been already working as a clerk. His record sheet shows him to have been OS Z/5688 Bristol Admin Dept. 16th July 1917 – 27th May 1918: Peel Castle, promoted to ABS on the 8th April 1918. Soon afterwards, he was demobilised. He was awarded the Victory and British Medals. The only prolonged time at sea appears to have been his spell on the Peel Castle. According to Wikipedia, this had been a passenger steamer, the SS Duke of York, which from 1894 to 1911 belonged to the Lancashire and Yorkshire Railway Co., then from 1911 to 1912 it belonged to the Turkish Patriotic Committee. In 1914, she was requisitioned by the Admiralty and re-named the SS Peel Castle. Refitted as an Armed Boarding Vessel, she was used in the Dover Patrol, then following repairs to damage she worked in seas north of Shetland, and finally in the Humber-Tyne Patrol, the time when ABS Torry was part of the crew. George Henry Torry returned to Bottesford, and in 1921 was once again living with his grand-parents on Queen Street. He eventually moved out, and in 1923 was living in Easthorpe, while they were still on Queen Street. He had got married in 1921 at St. Peters, Derby, to Elizabeth Beeston. She may have been born at Shardlow, Derbyshire, in 1893. George and Lucy, George Henry’s grandparents, moved back to Boston, where he died in 1932 and she in 1940. In the 1939 register, George Henry Torry was recorded working as a railway clerk in 1939, living at 84 Costock Avenue, Sherwood, Nottingham, with Elizabeth his wife, and daughter Lucie (b.1927). His mother, Sarah Torry, was recorded as a patient in Nottingham General Hospital, but there appears to be no record of his father, William Torry. Sarah died in 1954 in the Bingham area, and William in 1956, also in the Bingham area. Elizabeth Torry died in 1954 in Nottingham, aged 61. George Henry Torry probably died in Liverpool, in 1968, aged 71, though this is not certain. Another George Henry Torry born in 1897 and born in Preston, Lancashire, died at Newton Abbot, Devon, in 1970, but there is good reason to believe that he was not the man born in Sheffield and raised at Bottesford.